Synopsis: Dragon is a mystical creature and revered by the Chinese; as one of the 12 Chinese Zodiac, the Year of the Dragon represents prosperity. 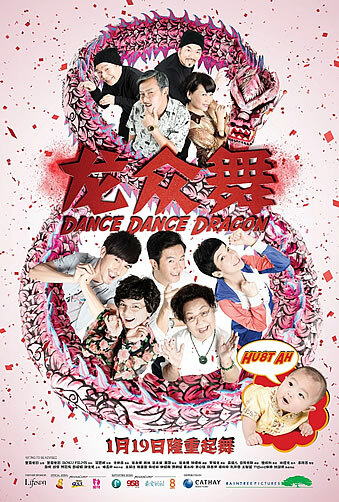 Dance Dance Dragon tells the story of Mother Loong who desires to have a grandchild. However, none of her three children have plans for any children. Things change for the Loongs on the first day of the 2012 Year of the Dragon when a newborn boy is found on their doorstep! Coming on the heels of their sleeper box-office hit ‘It’s A Great Great World’, it’s only inevitable that expectations are high for ‘Dance Dance Dragon’- not only Mediacorp Raintree Pictures’ first movie since Kelvin Tong’s top local box-office grosser last year, but also their first movie in a year after that hit. Unfortunately, despite boasting almost the same production team (with Kat Goh taking over the directorial seat for the first time from her mentor Kelvin), this ‘Dragon’ is quite the tame animal that is unlikely to leave much of an impression. Chief among this ‘Dragon’s’ faults is its over-ambition, squeezing too many plotlines into just 92 minutes of screen time. 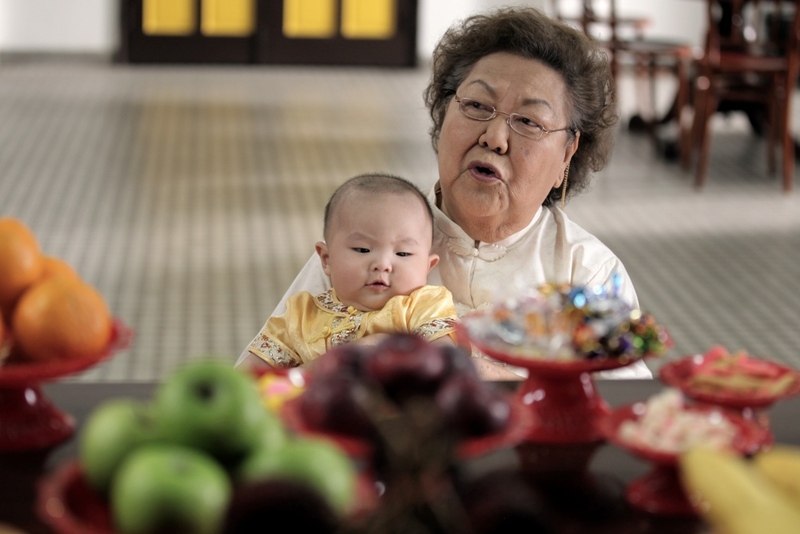 So with the arrival of the ‘Dragon’ year, the 84-year-old matriarch of the ‘Loong Zong Wu’ clan prays for the arrival of a grandson to be the successor. God (portrayed by a young boy acting in consultation with his Chief Financial Officer and Human Resource Director among others) sends down a baby boy through Mother Loong’s (Lai Meng) youngest son Ah Long (Melvin Sia). Prayers answered? Not quite- there’s still her ambition of getting her two daughters hitched. The eldest, Lucy (Dennis Chew in his love-it-or-hate-it Auntie Lucy getup once again), is already in her 40s and has just broken up with her Indian boyfriend (Dennis Chew again with a tan). Now Lucy’s only interested in ballroom dancing- tango, cha cha or waltz, take your pick- and perhaps occasionally in Chef Eric (Adrian Pang), a random guy who follows Ah Bee (Kym Ng) home after she inadvertently rescues him from two loan sharks. In between Lucy’s dancing ambitions, Ah Bee’s romantic sparks with Eric while demanding that he prepare a Chinese New Year feast for their family, and Ah Long’s training to rejoin his family’s lion dance troupe, there’s also a scheming relative Uncle Teck (Bryan Wong) and his family’s plotting (Benjamin Heng as his- what else- Ah Beng son) to take over ownership of the clan. 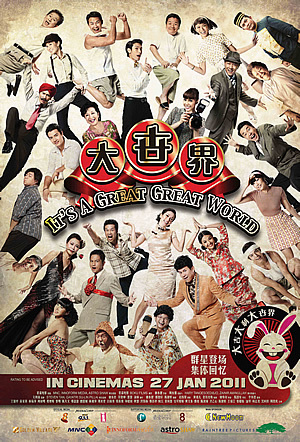 Though ‘Great World’ did boast a similar bevy of characters, that movie had the benefit of containing them within individual short stories rather than crammed within the same narrative. Indeed, when the two bumbling gangsters- Aw Gui (Marcus Chin) and Aw Gao (John Cheng)- whom Uncle Teck engages to steal Mother Loong’s purported grandson steal the show, it’s a clear sign of just how thinly drawn the other characters in fact are. The script by Kelvin and Marcus gives each little to do beyond a one-line description above, which makes their happily-ever-after ending obligatory in any Chinese New Year movie even more predictable. What’s worse is that there isn’t enough comedy in each of the scenarios to keep their audience entertained, and after a spirited opening chronicling the birth of the three Ah Loongs back in the 60s and 70s, the rest of the setups struggle to match the same level of wit and energy. Kat Goh’s inexperience as a director also means that many scenes lack punch, while others- especially those with Bryan Wong’s overacting- try too hard to compensate for the lack of any genuine humour. And for a movie that revolves around a lion dancing clan, these scenes are just too short (i.e. less than 30 secs each time) and noticeably lacklustre. Not even the combination of arguably some of the most talented local comedians manages to save the movie. Adrian Pang is largely wasted in a role that uses little of his considerable comedic potential, while Kym Ng is thrown once again into the stereotyped role of a Tomboyish woman with the loud voice and brusque manner. 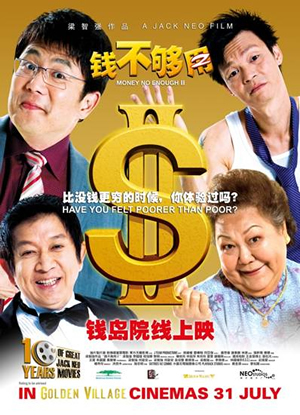 Dennis Chew is well… Auntie Lucy for better or for worse (we think it is more of the latter), but Bryan Wong takes the cake for being the most annoying character in the movie for speaking with a perpetual smarmy slur. And even with the lowered expectations of a Chinese New Year movie, ‘Dance Dance Dragon’ barely manages to get its feet off the ground- burdened as it is with too many underdeveloped subplots, unfunny dialogue, and slack direction- let alone take flight. It’s perhaps an even greater disappointment considering the dividends that the creative partnership between the once-formidable movie-making Raintree Pictures and Kelvin Tong’s own Boku Films yielded last year- and it suffices to say that this ‘Dragon’ is unlikely to make the leap to the top of the box-office charts.